The list of high quality nutrients found in Bee Pollen is staggering – whole vitamin nutrient complexes, up to 25 naturally chelated minerals and trace elements, free amino acids, omega 3 fatty acids, hundreds of bioactive enzymes, bioflavonoid plant pigments and natural hormones, as well as thousands of beneficial phytonutrients. Because Avian Granules start as flower pollen, the reproductive spore of plants, they are very concentrated sources of nutrients. The manufacturer of Bee Pollen - Avian Granules, Pet Power, is the only major pollen company that markets domestic U.S. Bee Pollen. It is blended from diverse geographic areas to achieve a balanced nutritional profile. Beware of local bee pollen, because it may be lacking in minerals that are missing from the soil of that area. Pet Power is also the only company that goes to the expense of keeping its pollen in cold storage – raw, unheated and unprocessed for freshness and nutritional integrity. Both Avian Granules and Avian Trio will supply your bird with a broad spectrum of the natural living food complexes that are missing in most bird diets. You’ll be amazed at how much your birds love the taste. 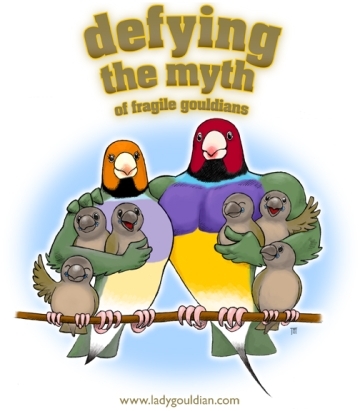 And you will love what these products do for the health and vitality of your birds. Packaging: 8 ounce and 16 ounce jars. Start slowly. Begin by adding a few granules to bird seed each day to get them accustomed to the new taste. 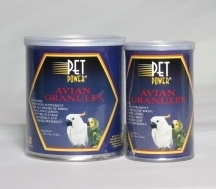 Avian Granules can be fed free choice, mixed in with food, or sprinkled on fruits and vegetables. Gradually increase the amount over the next 2 weeks until the dosage level reaches ¼ to ½ teaspoon daily for small to medium size birds and ½ to 1 teaspoon daily for large birds. Avian Granules are very beneficial when added to baby bird formula because it adds a complete spectrum of quality nutrients to start your birds off right.